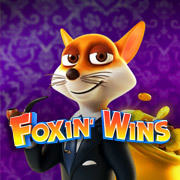 Foxin' Wins – 5 Reel, 25 payline 3D slot featuring a Random Bonus, Free Spins, Wilds, Scatters and a Superbet option. This story is about an aristocratic fox and his attempts to catch a mischievous leprechaun. The leprechaun wreaks havoc on the reels - catch him in the act and win great rewards! The Wild replaces all symbols except the Scatter. Get 5 Foxes on one spin across the reels to win up to 2 000 coins. 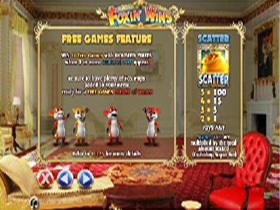 The Scatters activate the free spins round. Hit 3 or more of either the scatter symbols to win 10 free spins where all wins get doubled. This feature gets triggered randomly anytime after a cash payout. This Bonus adds even more winnings to players' payout. It's likely that this bonus can be triggered multiple times during a standard playing session. This is also a randomly triggered feature which will open up a second screen. Here players must chase the naughty Leprechaun; once he’s caught players get to shake him until he awards extra coins. 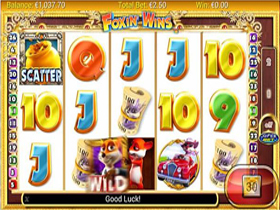 Foxin' Wins has many features to keep players enthralled, lots of action and worthwhile payouts.